Abby (Katherine Heigl) is a producer of a morning show. Due to faltering ratings of said show, her boss hires Mike (Gerard Butler), whose claim to fame is hosting The Ugly Truth, a show that tackles matters of relationships in a very male, if not misogynistic way. Abby is outraged at this choice of host. But since she herself doesn’t do very well in matters of relationships either, pining after her neighbor Colin (Eric Winter) who she thinks of as the perfect man, she strikes a deal with Mike at his suggestion: he will help her reel in Colin, and she will work with him. The Ugly Truth is absolutely horrible. It bowled me over with its hatred masquerading as some good old fun. It’s sexist and misogynistic. It’s so bad, it even makes a case that misandry does, in fact, exist. I hated it. Tiffany (Jennifer Tilly) has a plan: she will get her hands on the remains of the Good Guy doll that hosted Chucky’s (Brad Dourif) sould and she will get him back. He was her boyfriend before he became that doll after all. She actually succeeds, but their reunion isn’t quite as romantic as Tiffany wanted it to be. What’s more, Chucky changes her plans substantially when he decides that Tiffany should become a doll herself and makes it happen. Nevertheless, the two of them decide to go on a bloody holiday together. 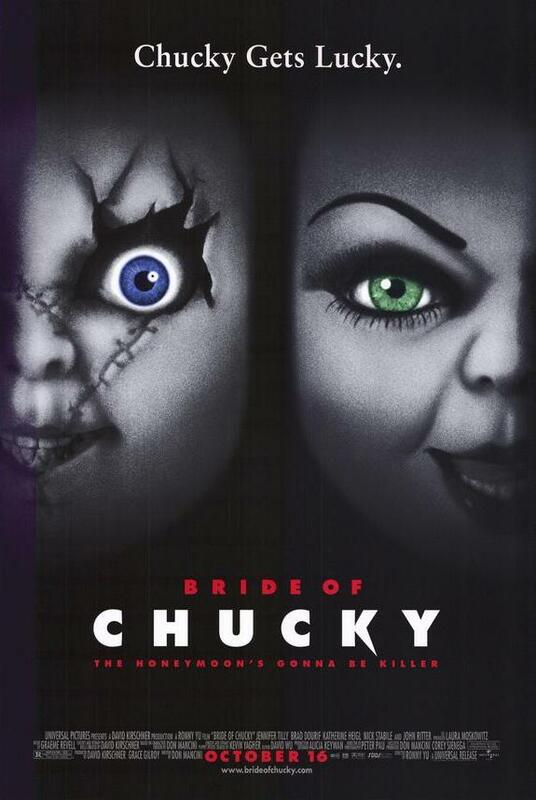 I can understand if you think that the series lost it entirely with this installment, but for me, it was a step upwards again from the last films, although there was still more than enough that wasn’t really great about Bride of Chucky.